Paddle across the tranquil waters of the Gold Coast keeping an eye out for Dolphins, Turtles, Stingrays. Visit two of our secluded islands and enjoy a delicious continental breakfast on the beach. Snorkel with hundreds of sub-tropical fish. 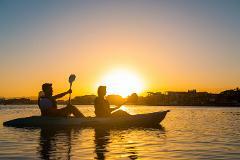 Guided Sunset kayaking tour in Surfers Paradise on the Nerang River.